pretties, paper, punches and me! I used Whisper White cs and stamped a few snowflakes then I ran it through my Big Shot with the Northern Flurries embossing folder. Then I punched some snwoflakes using my punch stacked them three high and spritzed the entire thing with Frost White Shimmer Mist. I matted it on some soft blue glitter cs. In the top photo you can see the shimmer mist on the Whisper White cs. It's on the snowflakes too. 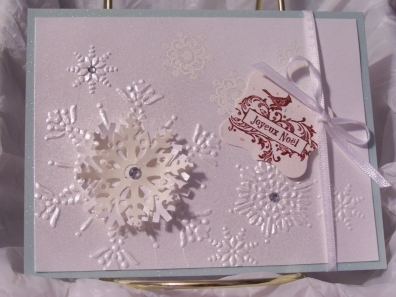 I added some rhinestones, a sentiment and some white satin ribbon. So that's it! 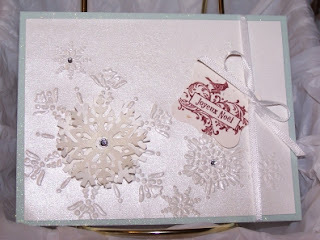 The challenge this week at on my Cuttlebugers Group at PaperCraftPlanet is LET IT SNOW! anyway, anyhow, anything that says SNOW! I'm a crafter/cardmaker. Copywrite Info: All content including text, photographs and design work are © Zack'sNana's Creative Imagination and Betty J Schaub. All rights reserved. These designs are shared for personal inspiration use only. Designs may not be copied for the purpose of publication or contest submissions. Betty J Schaub aka Zack'sNana. Awesome Inc. theme. Theme images by molotovcoketail. Powered by Blogger.